For the past two months, I've been writing the series "Give Me Some Sugar," on Southern women pastry chefs for the Southern Foodways Alliance & Southern Living's The Daily South blogs. 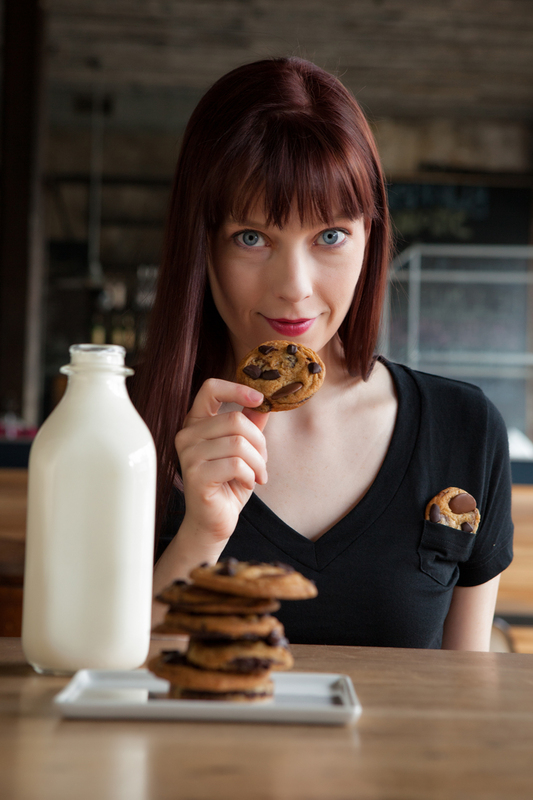 I've interviewed Momofuku Milk Bar's Christina Tosi; Sonya Jones, whose sweet potato cheesecake won over President Clinton (in his pre-vegan days); and Phoebe Lawless of Scratch-- one of my favorite bakeries in Durham, NC. Though I've thoroughly enjoyed conversations with all of the chefs I've talked to, one I was especially excited to have an excuse to chat up is Stella Parks, the pastry chef at Table Three Ten in Lexington, KY and the brain child (bravechild?) behind the superb baking blog BraveTart. I first found Stella through my friend Francis' twitter and in doing so hit a one-gal gold mine of baking skills, smarts, and quick wit. BraveTart, which Stella publishes with photographers Rosco Weber and Sarah Jane Sanders is a funny, beautiful, well-written, and incredibly helpful blog specializing in updated and creative version of classic American desserts. Think homemade Milanos, Salted Caramel Brown Butter Hazelnut Brownie Chunk Nutella Swirl Ice Cream (yep), and Bourbon Buttermilk Layer Cake. The profile I was writing on Stella for SFA was just a short little number, but as you can tell from the aforementioned ice cream title, she has a lot to say and it's all worth being said. Though I couldn't use all of her quotes (or just have her write the whole darned thing) for Give Me Some Sugar, I thought all of Stella's musings on gendered flavors, Kentucky sense of place, and "coming full circle" should be shared-- just like her Cookie Dough Reese's Cups. This year SFA is focusing on women, work, and food. In light of that, could you talk about how being a woman has informed your work as a pastry chef? I’ve experienced sexual harassment and gender discrimination in my life, but happily not at work. Obviously, I spend a lot of time “being a girl,” but I don’t think being a girl changes my approach to desserts anymore than it changes my approach to driving a car. Someone might say a dessert with malty, smokey, earthy flavors is “masculine.” But I grew up in the middle of a tobacco field, literally a stone’s throw from the world’s most famous bourbon distilleries. Am I making a masculine dessert by pairing tobacco ice cream with bourbon caramel? It doesn’t feel that way to me, it feels like a homey dessert. On the flip side, someone might say floral flavors are “feminine,” but I grew up watching the jockeys who won Derby have their horse crowned with roses, watching men go to church with a flower tucked into their boutonnière. Is a dessert made with rose flower water feminine? I don’t think so. I don’t think flavors are gendered. How did you get into baking? Did you always know this would be your path? As a kid, I’d bake for fun, but a career in food was nowhere on my radar. At 14, I got a part time job in a restaurant, and really enjoyed the work. All along, I wanted to write a book, so my teachers in school pushed me toward an English or Lit major. Throughout high school, I assumed that’s exactly what I’d do. Late my senior year, I suddenly wondered what that would make me when I grew up. I wanted to be an author. But getting an English major wouldn’t make me an author. Writing a book would. And writing a book would take time, and during that time I’d need to eat and pay rent and that sort of thing, so I thought how would I make money with an English degree until I wrote my book? I had no idea. But I knew I didn’t have a personality suited to teaching, or to journalism, or to whatever other English-majory jobs I could think of. I knew I liked working in restaurants, working with my hands and on my feet. Then I started researching culinary schools, thinking I could work in food service and write on the side. How would you describe your style/approach to baking? I don’t ever want anyone to try one of my desserts and think, “oh that was interesting” while simultaneously wishing they’d just had a brownie instead. I absolutely want to incorporate interesting techniques and flavors and textures into each dessert, but I want them to hit the spot. So I always approach a dessert as something that should satisfy whatever craving led a customer to order it. They always deliver a major flavor punch in a format that gives you something to sink your teeth into. What's your take on Southern food and how does it inform/appear in your baking? I’ve always used ingredients like buttermilk, sorghum, cornmeal, sassafras and bourbon. I’d never really thought about them being Southern (or “Kentucky”) until I started blogging. Then I’d get these emails form people in New York or Oregon, asking “where can I find sorghum?” or “where can I find stone ground cornmeal?” Then I started to realize how much the experience of growing up in Kentucky informed how I stocked my pantry, influenced my cravings. I grew up in a little country town called Versailles, so I have a “Versailles” macaron, which plays on the French/Kentucky dichotomy the name suggests. It’s an almond free cornmeal shell with a sorghum buttercream. What makes food "Southern" in your mind? How do you connect to the history of the South (through food or otherwise)? My sense of Southern hospitality is about unpretentious generosity. I like riffing on recipes that have come down through the generations, like apple stack cake or lady Baltimore. Actually, I picked up a copy of the 19th century novel, Lady Baltimore because I wanted to read it and get a better understanding of what that original cake might have been. It’s a stunning novel, equal parts romanticism and racism and culture and class. It didn’t tell me anything new about the cake, but it gave an incredible look at the “old South” into which it was born. A slower way of life that allowed for a celebratory slice of cake in the middle of the day for no reason at all. What's your favorite thing to bake? Favorite baked good to eat? What's your most prized kitchen item? I have a set of plastic measuring spoons that I’ve used since I was about 8; they came as part of a cookbook set my parents bought for me. I dug them up recently at my folks’ house and decided to take them to work. It’s a nice sense of coming full circle. 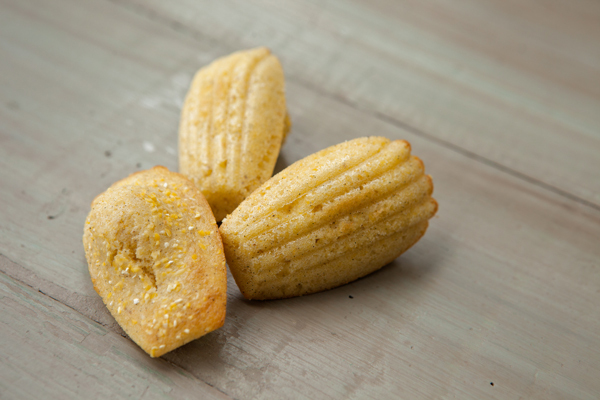 Leaf lard adds an amazing richness to the madeleines and makes my favorite version by far. If that’s a problem ingredient for you, or just inconvenient, melted (or clarified) butter will work nicely too. 1. 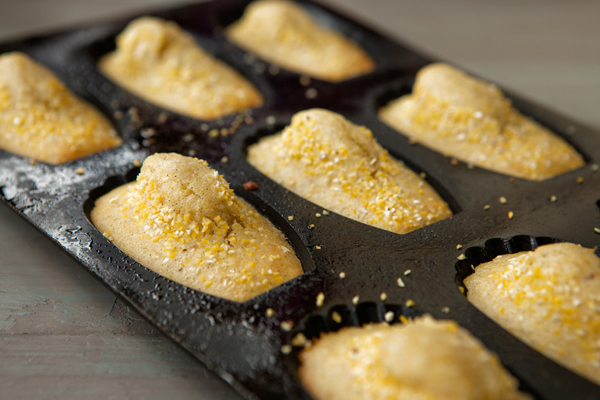 Preheat the oven to 350° F and lightly spray the madeleine mold (it helps the shells brown better with silicon) or mini-muffin tin. If using a cornbread pan, brush the molds with butter or oil and put it in the oven and wait until it’s piping hot before filling. This will give you a great crust and prevent sticking. 2. Making the batter couldn’t be easier. Combine all of the ingredients in a bowl and whisk until no lumps remain. Let the batter stand for 10 minutes, or until it thickens, before filling each shell 3/4 full (about two teaspoons). 3. Bake for 8 to 10 minutes, or until the humps no longer seem to have molten centers. I love these cookies best served warm, but they’ll keep for about two days in an airtight container (becoming increasingly perfect to dip into hot coffee or tea). They’re also great toasted, with a dot of jam. I love hearing about other people utilizing their Southern roots. I never realized what a different experience I had growing up until I moved to the city.